HBO Sports, widely acclaimed for its innovative boxing programming, takes an in-depth look at Daniel Jacobs, one of the sport’s true superstars in and out of the ring, as he makes his return in November in the talent-rich 160 pound division against undefeated middleweight Luis Arias, when MY FIGHT: DANIEL JACOBS debuts SATURDAY, NOV. 4 at 11:00 p.m. ET/PT following the prime time replay of the HBO BOXING AFTER DARK telecast from Monte Carlo. The special will also be available on HBO NOW, HBO GO® and HBO On Demand®, and at hbo.com/boxing, as well as other new media platforms. Former middleweight champ Daniel “Miracle Man” Jacobs (32-2, 29 KOs), returns to action following his superb performance against fearsome pound-for-pound king Gennady Golovkin this past March in New York where “GGG” edged the Brooklyn native out on points. 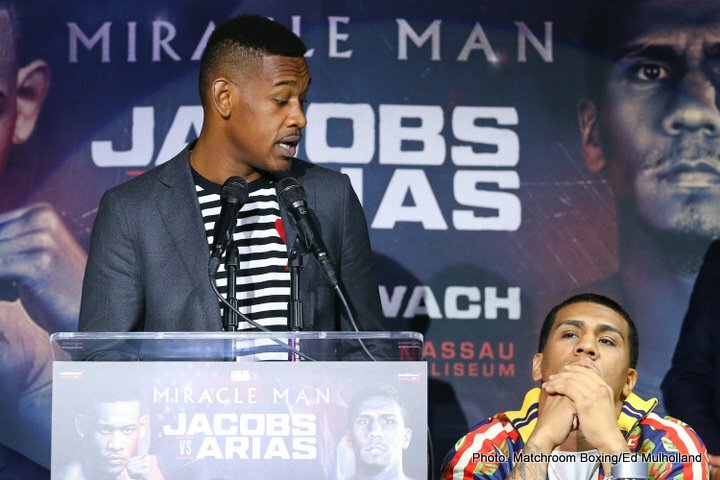 Jacobs will be looking for an explosive performance against the unbeaten American Arias as he looks to get back into title contention and a force to be reckoned with in the stacked middleweight division. MY FIGHT cameras travel with Jacobs in his proud hometown neighborhood in Brooklyn, NY to chronicle the long journey it took to reach the elite level of professional boxing. On Saturday, Nov. 11, Jacobs and Arias meet at NYCB LIVE, home of the Nassau Veterans Memorial Coliseum in Uniondale, New York, in a 12-round showdown that will be televised live on HBO World Championship Boxing as part of a tripleheader event beginning at 10:00 p.m. ET/PT. For more information, visit hbo.com/boxing; become a fan on Facebook at facebook.com/HBOBoxing; and follow on Twitter and Instagram at @HBOBoxing. Follow the conversation using #JacobsArias.